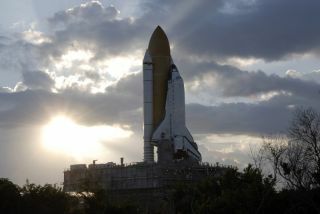 Space shuttle Atlantis is illuminated by the sun as it rises through the clouds over NASA's Kennedy Space Center in Florida as it moves to the launch pad on Oct. 14, 2009 for a planned November launch. NASA is about to open space shuttle launches to a whole newaudience. About 100 lucky followers of NASA?s Twitter feed aredescending on the agency?s Cape Canaveral, Fla., spaceport to get a front rowseat to the planned Monday launch of space shuttle Atlantis. The gathering isthe first time NASA has held an event for Twitterers to view a shuttle liftoffin person. Atlantis is scheduledto fly on Nov. 16 at 2:28 p.m. EST (1928 GMT) from Launch Pad 39A at NASA'sKennedy Space Center. "This will be my first time getting this close to alaunch," said Erin Libranda of Katy, Texas, whois planning to attend with her daughter Jordan Dailey. Libranda said shehopes that the shuttle can lift off on time and "that it is as excitingbeing there in person as it is watching it on TV." Libranda saw the opportunity announced on her local news andsigned up as quickly as she could. NASA gave tickets to the two-day eventto the first 100 people to register. "I'm certain it will be one of those 'top moments' ofmy life," said another tweep (Twitter user), Adam Fast of Lawrence, Kan."I'm most excited to feel the ground shake, see the rockets light and meetsome of the people behind all that happens." Fast, a pilot, said he thinks it's important to educate thepublic more about NASA's activities and how they could impact everyday lives. "NASA seems to be working hard to share what they'redoing, but I don't think they're going deep enough yet," he toldSPACE.com. Tina Cassler, another attendee, grew up near the Floridaspaceport but moved away 25 years ago and hasn't been back since. She travelledfrom Lauderdale, Minnesota for the event. "The behind-the-scenes aspect intrigues me,"Cassler told SPACE.com. "I hope to learn a great deal and betterunderstand all that they do at NASA. For their part, theastronauts planning to ride Atlantis on an 11-day trip to the InternationalSpace Station said they are excited about the tweetup. "I think it's exciting that this is generating moreinterest in space exploration and certainly interest in the last few missionsof the shuttle," said STS-129 mission specialist Bobby Satcher in apreflight news conference. "It's bringing on the next generation who liketo communicate in this kind of way and form their social networks this way. I'mexcited that there are a lot of people who are twittering that will befollowing the mission." Satcher, an orthopedic surgeon, is actually pulling tweetingdouble-time for Atlantis? mission as he posts updates as Astro_Bones andZeroG_MD. Crewmate Leland Melvin, a veteran spaceflyer, is also posting Twitterupdates as Astro_Flow. The mission's commander, Charlie Hobaugh, however, expressedbemusement at the whole affair. "I am in the stone ages as far as mass communicationsgoes," Hobaugh said. "I don?t even know how to text message. Bobby,it's all up to you!" The tweetup is part of NASA's growinginvolvement with the Twitter micro messaging service. Two spaceflyerscurrently onboard the space station ? NASA astronauts Jeff Williams("Astro_Jeff") and Nicole Stott ("Astro_Nicole") ? also postupdates to the site.